This section is a work in progress, so if you can’t find information regarding the specific species you want, then please feel free to contact me, and i will reply as soon as possible. Or you can just make a comment in the comments section below. To select the species you wish to find information on, please click on the appropriate thumbnail below, thanks ~Mitch. Hi, I’m looking for information on keeping a Praying Mantis. I have been doing some reading up back can’t really find any solid information relating to keeping them in the UK. I know we would need to have some sort of thermostat controlled heater to keep the temperature stable but not sure where to get info on what type to use. I must apologise for not providing this kind of information as of yet. As you can see from the page here, i always fully intended to do so. Your message has now prompted me into prioritising the writing of some guided care sheets etc…. Basically the conditions required (temperature, humidity etc…) is dependent upon species you want to keep. 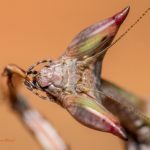 I will write up a generic care sheet to start with, just to provide basic care and requirements and then i will move on to writing up care sheets that are tailored more specifically to the Mantids i am currently selling and so on…. But for now, do you have a species in mind? I can mail you some specifics related to that species in the mean time if you like? 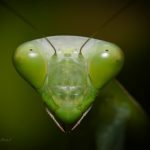 I am completely new to the world of keeping Praying Mantis and in my research I have read that the Asian Mantis & African Mantis are generally recommended as a starting place for newcomers due to their hardiness. I personally like the green colouring of the giant Asian Mantis. The offer of mailing me some information would be greatly appreciated! As I mentioned in my previous message I’m finding it difficult to get information on keeping them in the UK. Most places say room temperature between around 18 – 30 degrees is optimal (depending on species) & spraying the habitat every 2nd day to keep up humidity levels, but with living in the UK I would imagine that it is advisable to have some sort of thermostat controlled heater mat as temperatures here (as you’ll know) mostly don’t stay around that range. Thanks again! I appreciate you taking the time to inform me. It’s nice that you have concerns and are keen to do the research before committing to taking on one of these amazing creatures. I agree that the large ‘green’ species tend to be a good starting point for a first Mantis for the reasons you stated. I am currently working on a generic care sheet this weekend that although won’t be suitable for more ‘exotic’ species, will certainly be adequate for the more robust ‘beginner’ species. Keep an eye out for the post and if you have any further questions please don’t hesitate to ask. Although they’re not advertised on here, I do actually have a species of African Praying Mantis available that is perfect for a beginner so if and when you are ready, just give me a shout. Picked up a good sized glass tank today to start my terrarium. I’ll get it set up & keep an eye on the temperature to see what it’s averaging then find out what sore of heat source would be ideal to use. I’ll definetly contact you when I’m ready for a mantis if you still have any African mantids available. Hi David, apologies for not replying sooner as i’ve been away on holiday for a while. Great news that you’re getting sorted with the set-up 🙂 Yes i still have some….i already put one aside for you anyway so no worries…..just let me know when you’re ready. Sorry i haven’t posted that generic care sheet either, just been so busy lately. I have written most of it out so i’ll be posting it by the end of the week. Yes there is very little regarding these little guys, but i’ve had them for a few generations now, so i can give you a few pointers based on my experiences. So i found that they are quite happy at a standard type of temperature, between 23-26C is fine, no additional heat required if the room you keep them at is sufficiently warm. Humidity around 60-70% is fine, a light mist every couple of days is ok.
For food i think flying prey is best, so any type of flies, and also wax moths etc is good too. Hey. was just wondering if you can put multiple orchid mantis in the same viv? I have an exo terror 45x45x45 and have browsed around to fill it and have to say the mantis has got my attention. I wouldn’t advise keeping Orchids communally. They might be alright for a while in a large viv’, with lots of food. But they would most likely attack each other eventually….they’re very aggressive. Congratulations on your decision to get into this awesome hobby of keeping a praying mantis 🙂 You’ll be hooked in no time! Here’s a general care sheet that i put together some time ago. It’s a very basic, and general piece aimed specifically to beginners, just to give you a general idea of what to think about before you make a purchase….i hope it help. Feel free to ask any further questions. I’m looking into keeping Idolomantis Diabolica, is there a good care sheet for them or does your general care sheet cover that species? I don’t have an official caresheet written up just yet (something i’m planning to do for all species in the near future). The devils like it a bit hotter at 26-30C, but at this young stage (1st-3rd instar), they’re ok at 23-26C. They like it dry too at 30-50% humidity, as they get older they like it even drier at 20-40%…..so light mist maybe once a week is fine, just for them to drink. They do prefer flying prey (all flies and moths etc). Some people do offer other prey items, but in my experience they much prefer flies. This species has difficulty gripping glass/plastic enclosures. So if you are planning to keep it in a vivarium then you might want to think about adding something to the sides for grip (mesh or rubber drawer liner works well). Or you can just make sure there is plenty of sticks/branches in there etc…. Alternatively, a mesh cage is good, lots of ventilation too, which this species also likes. Good choice of mantis for sure 🙂 I love this species. This species requires a little more humidity than the usual mantis, so around 70-80% is nice for them…..but they’re quite hardy too, so don’t worry too much about letting it drop from time to time….temperatures the same, they’re happiest around 24-26C, but they can tolerate a wide temperature range. The females will reach around 7cm, and the males around 3-4cm. They prefer flying prey (flies and moths etc…. ), but when a little bigger, they’ll eat small hoppers, locusts, and mealworms as part of a balanced diet.